With the knowledge and skills of their drum and dance performances passed from father to son The Drummers of Burundi are rightly recognised as one of the greatest percussion ensembles in the world. 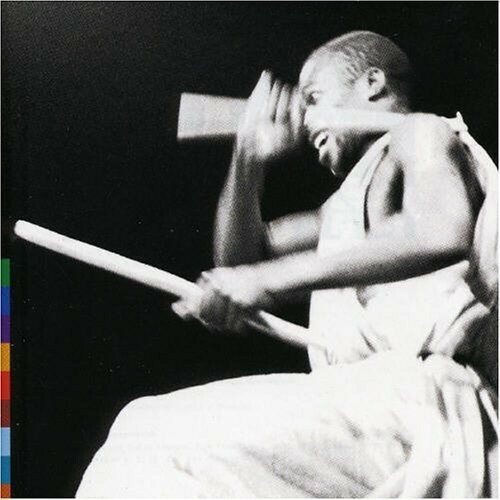 "The Drummers of Burundi first took the UK by storm at the legendary inaugural WOMAD Festival in 1982. Over the last 20 years they have been a major influence on such musicians as The Clash, Joni Mitchell, Echo and the Bunnymen, Adam and the Ants, Malcolm Maclaren and Bow Wow Wow. The Drummers of Burundi are Master Drummers from the small African country between Democratic Republic of Congo and Tanzania. Their performances are as much a spectacle of dance as music. A crescent of around a dozen great log drums, made from hollowed-out tree trunks covered with dried animal skins, are pounded by the drummers in traditional Burundi costume. In the centre of the semi-circle, the painted Inkiryana lead drum is played by all of the drummers in turn before each piece ends. The drummers leap, twist and spin around the Inkiryana with tremendous energy, dancing with as much skill, expressiveness, and thunderous excitement as they drum. "The Royal Drummers of Burundi is a percussion ensemble from Burundi. Their performances are a part of ceremonies such as births, funerals, and coronations of mwami (Kings). Drums (called karyenda) are sacred in Burundi, and represent the mwami, fertility and regeneration. The Royal Drummers use drums made from hollowed tree trunks covered with animal skins. In addition to the central drum, called Inkiranya, there are Amashako drums which provide a continuous beat, and Ibishikiso drums, which follow the rhythm established by the Inkiranya. The performance of the Royal Drummers has been the same for centuries, and their techniques and traditions are passed down from father to son. The members of the ensemble take turns playing the Inkiranya, dancing, resting, and playing the other drums, rotating throughout the show without interruptions. At the start of their performance, the drummers enter balancing the heavy drums on their heads and singing and playing. There are some extra members who carry ornamental spears and shields and lead the procession with their dance. They then perform a series of rhythms, some accompanied by song, and exit the stage the same way, carrying the drums on their heads and playing. Beginning in the 1960s, the Drummers have toured the world. They have recorded three albums - Batimbo (Musiques Et Chants) in 1991, Live at Real World in 1993 and The Master Drummers of Burundi in 1994. They have also appeared on Joni Mitchell's The Hissing of Summer Lawns (1975), on Zimbo, the B-side of the Echo & the Bunnymen 12" single of The Cutter (1983), they have influenced artists such as Adam and the Ants and Bow Wow Wow, and inspired Thomas Brooman to organize the WOMAD festival in 1982, which shaped the burgeoning world music genre.